Reefs and shoals everywhere and not a gap to be seen! Well it certainly looks like it when you glance at the charts for most locations in the Bahamas. We found it when previously planning for the Abacos, and the Exumas chain seems to be no different, in fact I would say the reefs look more dense there. Our experience has been, though, that once there, navigating the hazards with good planning, everything will work out. The reefs marked with Xs. Even before you get to your Bahamian destination you have to make your way to a good jumping off location in Florida, and then you get to cross the mighty Gulf Stream! This great body of water moves 30 million cubic meters of water per second. The stream moves north at between 3 and 4 knots, and is 4,000 feet deep in parts. So where do you start, and even more important, where do you aim? And when you get there, where do you want to go, what do you want to see, and how do you avoid the shallows and reefs? The secret to success is in the planning. 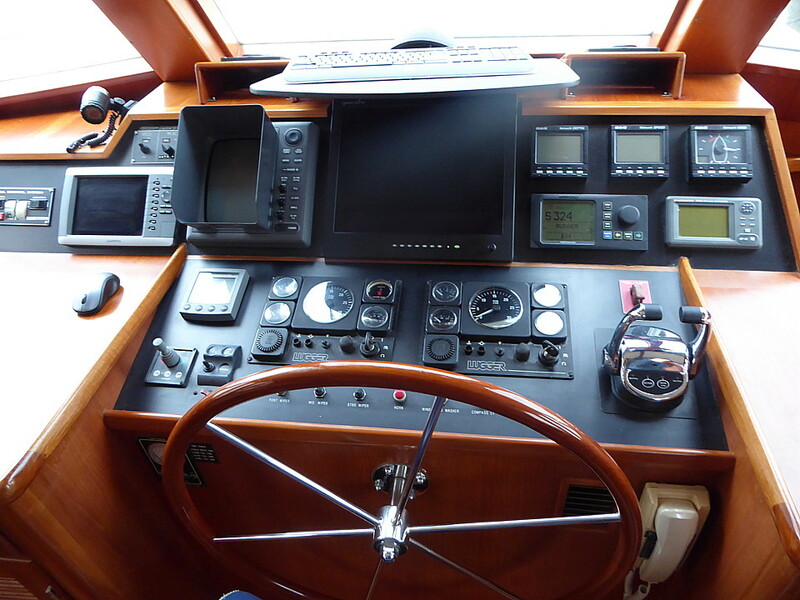 With the tools available to boaters today, a lot of the course planning can be done in the home on a laptop, and then taken on board and either uploaded into the electronics or manually entered, depending on the interface available on your equipment. Most GPS manufacturers have provided, at no or little cost, software that is compatible with their GPS systems. 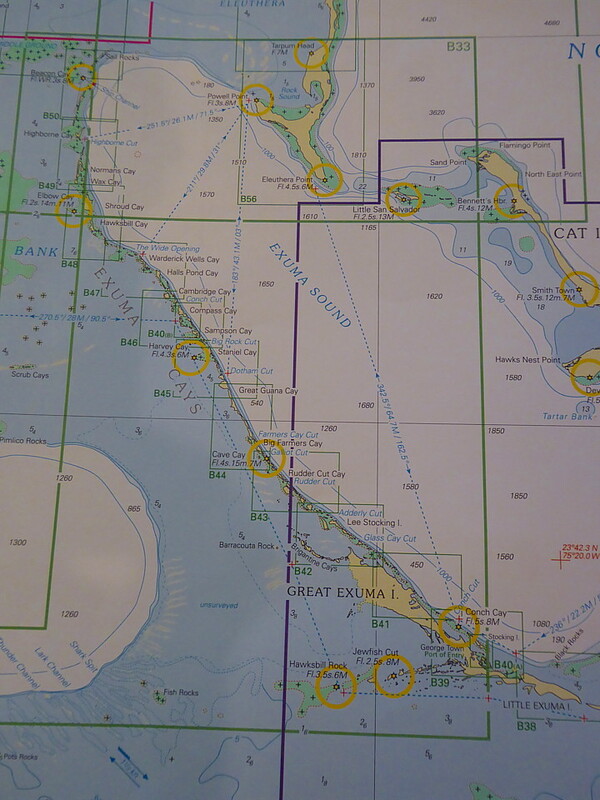 There are many Internet sites where you can plan your route using in-line charts, which are overlaid with marinas, fuel locations and prices, reviews of anchorages and other useful navigation information added by other boaters. 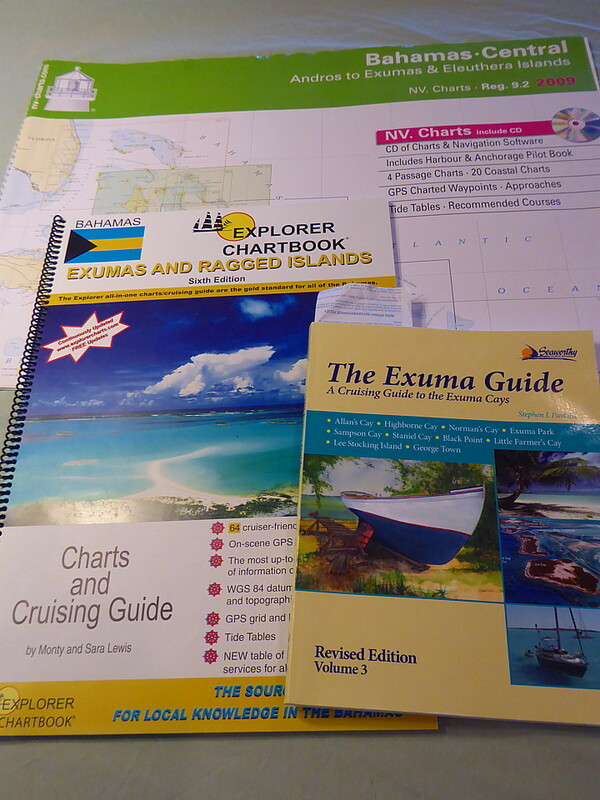 We also use paper charts and cruising guides. The downside to these is that they may not be as up to date as the electronic versions. However this mostly impacts how shoaling (or shifting sands) are shown. You usually don’t find land, reefs, or rocks moving very often! 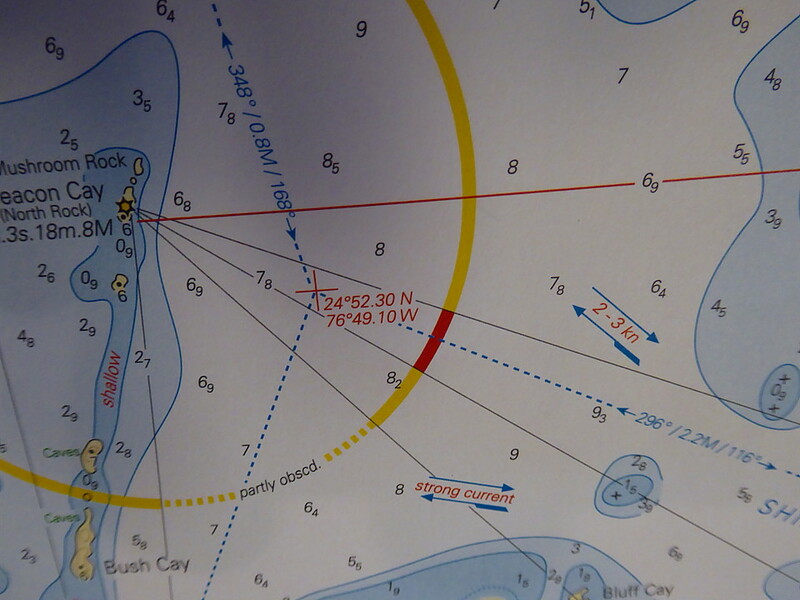 The other benefit of charts and cruising guides is that they come with way points already notated. 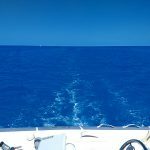 These are the compass headings and distances you can use that will take you to your destinations using deep water while avoiding any obstacles. They also include details on safe anchorages, and provide additional information on marinas and towns, plus interesting places to visit ashore. Once the way points are put into the GPS and we are in open water we can set the auto pilot to follow the route, or allow the GPS to feed points to the autopilot and let the boat direct itself. The autopilot has a built in compass and takes control of the steering. By inputting a direction or feeding coordinates from the GPS it will keep the boat on course. It is actually much more effective and efficient than a human. Sonas has redundant (that is two of each) GPS and AutoPilot systems. 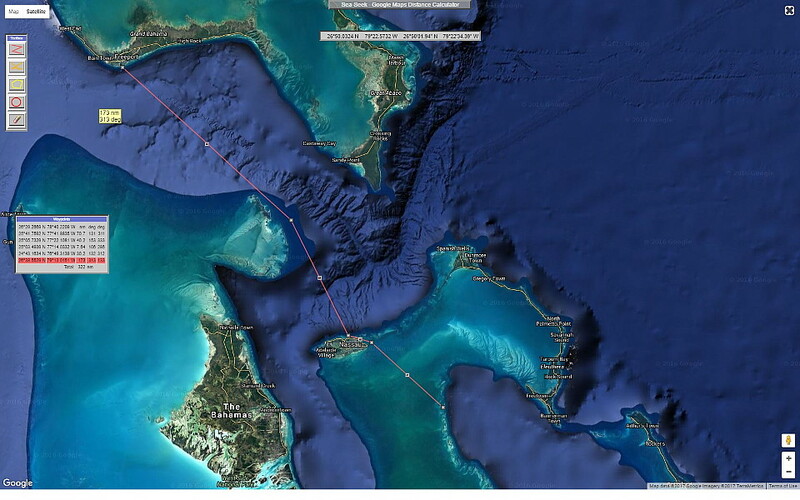 We have planned our route and layovers to the point of arriving in the northern Exumas. After that we will simply take it day-to-day. Previous crossing have been while I have been working, so had to be speedy, meaning long days to get there and back quickly. Because I am now retired we have time on our hands. Plus this time we have Grace, our lab mix pooch, who prefers regular stops along the route as well as nightly doing-her-business ashore. Day 1: Home port to Palm Coast, 61 miles. Day 2: Palm Coast to Titusville, 75 miles. Day 3: Titusville to Vero Beach, 74 miles. Day 4: Vero Beach to Palm Beach, 65 miles. 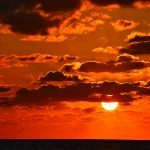 Day 5: Crossing to Lucaya, Grand Bahamas, ~80 miles. Day 6: Lucaya to Nassau, ~110 miles. 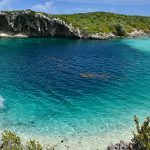 Day 7: Nassau to northern Exumas, 45 miles. 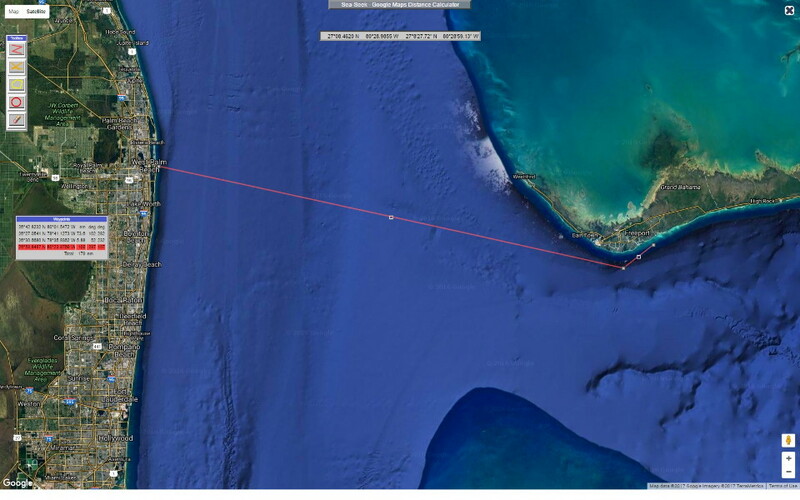 The very first time we crossed to the Bahamas, on a trip to the Abacos , we made the decision to cross at the shortest point between Florida and the Islands. This was from Palm Beach to West End Grand Bahama Island. A distance of approximately 56 nautical miles, or 64 statute miles. Because it was our first time we also found a buddy-boat to cross with. The second time, having more confidence and knowing where we wanted to go, we left further north at Fort Pierce and ran to Walker’s Cay. That time on our own. That was around 102 nautical miles, or 117 statute miles. Because we are heading for Lucaya this time, Palm Beach is again a good jumping off point and minimizes the effect of the Gulf stream when crossing. And crossing the gulf stream requires planning in itself. There are formulas and settings that you can use, however you are always guessing at the effect of the stream and how fast it is actually moving, plus wind offset. We will set our waypoint for Lucaya, but take the stream into account and aim further south and then as we cross let her come gradually up on the mark. For example, if we will be in the Stream for four hours and estimate a 3 NM impact each hour we will start off aiming 12 NM south of our Stream exit point. After an hour we will check and make the exit point 9 NM south of where we want to exit. And so on. It won’t be a completely straight line, but certainly not the curve which would have been created by taking direct aim and adjusting when getting pushed north. The navigational purists reading this will say but…but,,, if you do this, then that, then you will end up with a rhumb line. OK, but I estimate what the current is, estimate how long we will be in that current and therefore roughly its impact to us, and then head that much further south, adjusting my aim north towards the actual point I want to arrive at as we cross the Stream. To date I have not been far off with my approach! When we first crossed from Palm Beach to West End the course was pretty much due east and meant we crossed with the stream on our beam (that is, against the broadest side of our boat), so the effect was greater. Going from Fort Pierce and now to Lucaya, we will be somewhat more bow into the stream, reducing the impact of the current . Once in Lucaya we will overnight at the Grand Bahama Yacht Club, and then the next day we will head pretty much south east. Here we have two choices. Head for the Berries or Nassau, Providence Island. 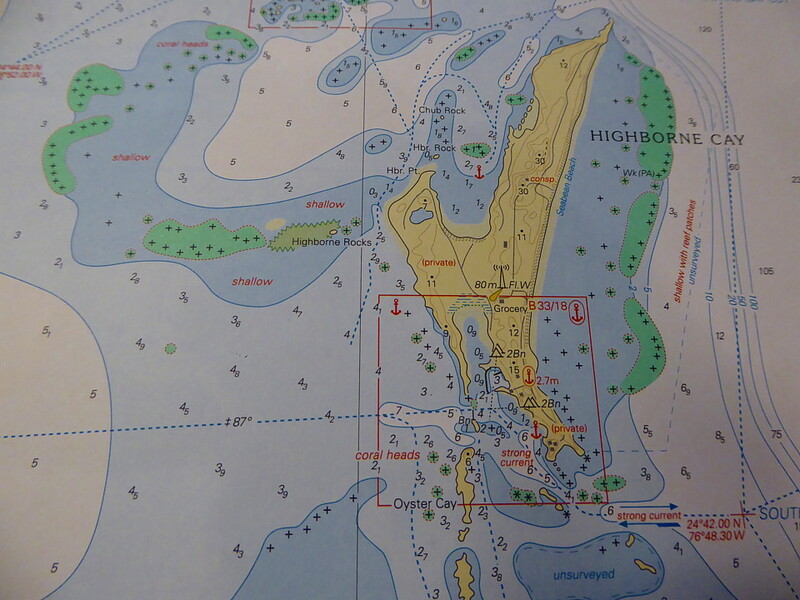 Right now we are planning on Nassau, after which it is a short hop across to the northern part of the Exumas chain! And once there the fun begins. 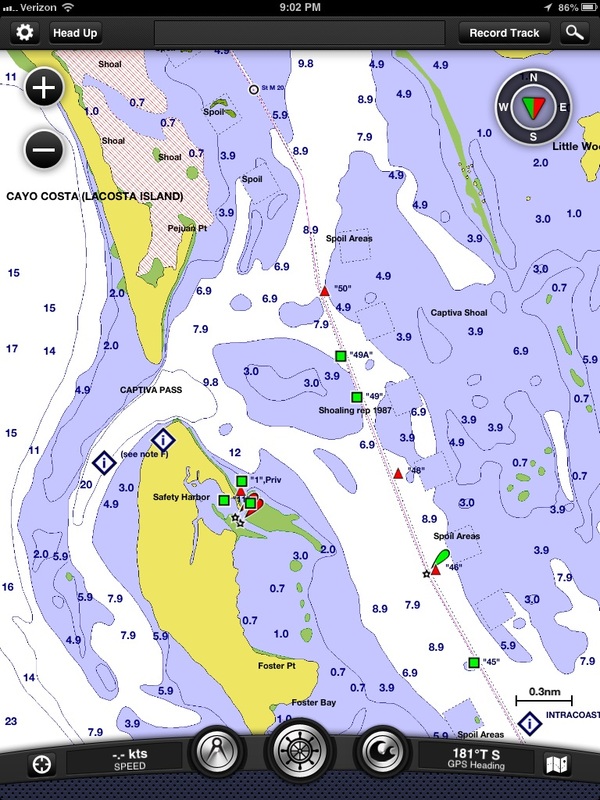 We will use the charts and cruising guides to plan our time there. 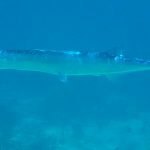 The chain is approximately 100 miles long, and since we will be there for around three months, we can stay in locations as long as we want, or move on. Even when moving on we are only talking about a journey of an hour or two to the next anchorage. Our aim is to anchor out as much as we can, using the boat the way she was intended to be used and is equipped for. Next up: Boat and Equipment. Paul and Sian ~ loving reading all about your planned adventure! I know nothing about boating but was definitely fascinated by all that’s involved in getting the kitchen ready for such a long journey 🙂 Looking forward to reading more as you set sail. Glad to hear how much Paul’s retirement suits you both! Belated Happy New Year! Retirement is great – so far Sian hasn’t kicked me out of the house, which is positive! Hope all is well back at the salt mines. LOL, yes I meant galley! 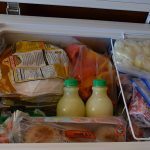 Although I always thought a galley kitchen referred to those small narrow kitchens, not the one on your big yacht! 😉 Glad to hear Sian hasn’t kicked you out yet, at least you have Sonas to go live on until she lets you back in. All good at J&J, we’re keeping out of trouble! You are missed of course! Feel free to send a meme to the team every once in a while to be remembered by. Take care! It looks like you’re having a ball as a retiree and hopefully you’re not driving Sian too crazy! Our group’s “meme” email activity has been way down since you left. I hope you had a great holiday and safe travels on your upcoming trip!! That Gulf Stream you mention becomes the North Atlantic Drift, the reason we get mild weather here in Derry, still can’t understand why you and Sian think it’s cold here! We don’t think it’s cold there – we know it! George Town, Exuma, high 70s this weekend (25 degress C) and warming! Should be nice and toasty by the time you guys get there!